Originating in New Zealand, Braeburn apples are bi-coloured, being blushed with red, which can sometimes have an almost striped appearance. Crisp and juicy, this variety of apple has sweet flavour with just a subtle tartness reminiscent of its presumed parent, the Granny Smith apple. Often called the 'definitive cooking apple’, Bramley is popular for its sharp, strong flavours and light fluffy texture when cooked. It is a variety that is much larger than most and is characterised by a flatter shape and a very green skin. The Cox apple is the classic British apple and discernible by its red/orange dappled effect. Hailed as the finest of dessert apples, Cox has an almost multi-dimensional flavour alongside a juicy, crisp texture. Originally known by the name of Alkmene in Germany where it was initially grown, these apples received the name Early Windsor when introduced to the British markets in the 1960’s. Another bi-coloured fruit, Early Windsor has a bright red flush with an occasional emergence of stripes; However the Early Windsor is often of a more red hue than many other of its bi-coloured brothers. The aromatic flavour of the Early Windsor bears a resemblance to that of its parentage, the infamous Cox apple. Particularly distinguishable by its gold colouring, the Egremont Russet apple is Sussex born with a distinctive nutty flavour which is often drier than many of the more dominant apples on the market, yet nonetheless sweet and moist. As a russet apple, the texture is not the smooth feel of a Cox that is often considered characteristic of all apples, and actually almost resembles that of a very firm pear. A classic North American red, Empire is of a deep red colour that is occasionally speckled with a pale green and inside revealing a bright white flesh. With a crisp texture and a sweet and ‘vinous’ flavour, as described by the experts, it is a popular family apple; loved by children and adults alike. A shade of deep red that is sometimes spotted, the New Zealand Envy apple is the progeny of both two particularly popular apples; the Braeburn and Royal Gala. As a result it has a well loved combination of a crunchy, crisp texture and an incredibly sweet flavour. Another New Zealand Variety, the Gala apple has first class parentage having been grown as a cross of Golden Delicious and Kidd’s Orange Red. With such excellent ancestry, the Gala is characteristically sweet, juicy and crisp with an orange hue. An American apple, the Golden Delicious is both versatile and exceptionally sweet. Suitable as both a dessert and cooking apple, this green/ gold fruit has been one of the biggest sellers of the 20th century evidence of which is obvious in the tens of varieties which Golden delicious has parented. A much younger apple variety, having been first cultivated in the 1980’s, Jazz apples are already pulling ahead of the more traditional brands on the market. With Braeburn and Gala parentage, Jazz is a hard and crisp apple with a strong sweet yet sharp flavour that has a pear-like undertone. Similar to that of its parents, the Jazz apple has deep flushes of red and orange. Jonagold was an apple bred in the 1940's to improve the crispness of the Jonathon apple, by crossing it with a Golden Delicious. Forty years later, a Belgium grower, Mr Morren, was attempting to recreate this breeding and found that on one branch of the Jonagold tree, a very different type of apple was emerging. On one half of the tree grew apples of a far redder hue than the original Jonagolds which grew other side. These red fruits became Jonagored apples and the tree was propagated to recreate effect. Usually yellow/ green in colour with small areas of red blush, the Jonagored is a larger variation of the fruit and as such is favoured by commercial growers, especially with the sweet but sharp aromatic flavour as an added extra. 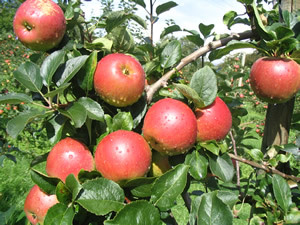 A New Zealand apple, the Smitten variety is quite unique in its ancestry with a distinctive mix of Royal Gala, Braeburn, Falstaff and Fiesta. With colouring very similar to that of its Braeburn predecessors, the gold and red Smitten apples are being hailed for their firmness and full flavour. With more of a maroon tone, the Spartan apple is smaller relative to other red dessert varieties and all the sweeter and smoother as a result. As a McIntosh variety, the Spartan has the characteristic ‘vinous’ taste that have made the North American apples so popular, along with the whiter-than-white flesh underneath a strong red skin. The colour of Worcester apples has a high degree of commercial value, being an intense red that can rival even the hues of Empire and Spartan apples. Worcester apples are also said to have strawberry notes to their flavour which have led to several breeding programmes to enhance and harness such flavour.